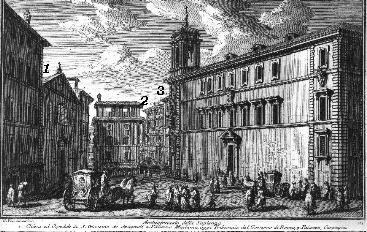 The Archiginnasio, let us say the University of Rome, was in this palace mainly built by Giacomo della Porta under Gregorius XIII and Sixtus V. The view is taken from the green dot in the 1748 map below. 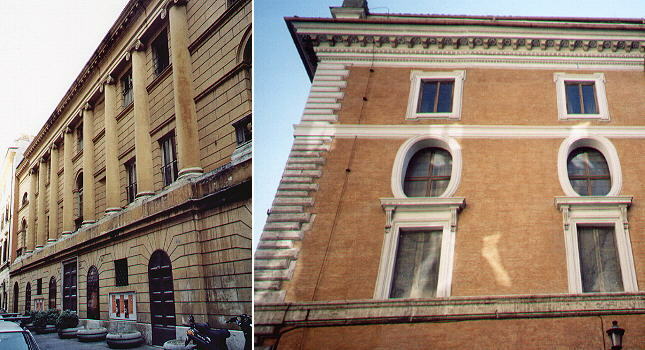 In the description below the plate Vasi made reference to: 1) S. Giacomo degli Spagnoli; 2) Palazzo Madama; 3) Palazzo Carpegna. These monuments are all shown in other pages. 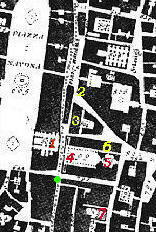 The small map shows also 4) Archiginnasio della Sapienza; 5) S. Ivo alla Sapienza; 6) Biblioteca Alessandrina; 7) Teatro Valle. The dotted line in the small map delineates the border between Rione Parione (left) and Rione Sant'Eustachio (right). 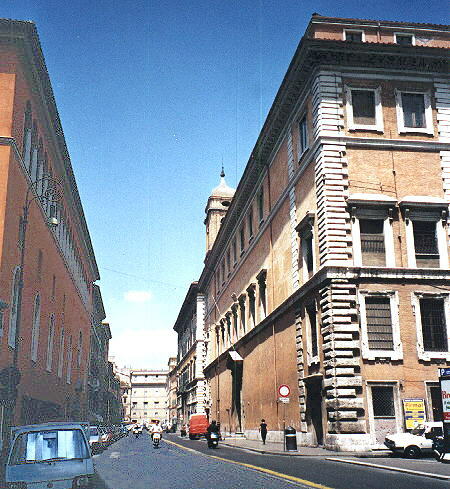 The very narrow street between the Archiginnasio and the church of S. Giacomo degli Spagnoli was enlarged in the 1930s by curtailing the nave of the church and by pulling down the houses in between. The view towards Palazzo Madama is hidden by Palazzo Carpegna which was pulled down too and rebuilt in a slightly forward position, in line with the façade of the Archiginnasio. 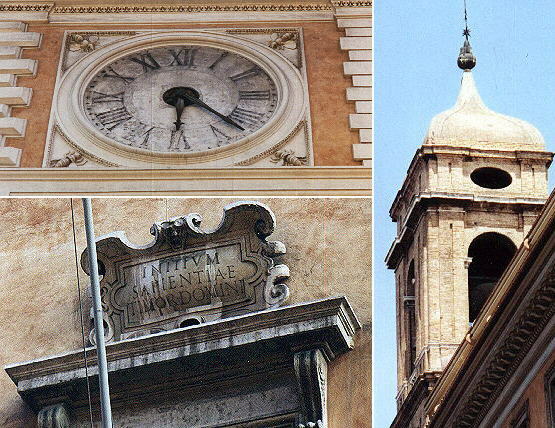 The name derives from the inscription over the entrance "INITIUM SAPIENTIAE TIMOR DOMINI" (the beginning of knowledge is the fear of God) and la Sapienza is the name of the modern University of Rome. The building has now a different use (National Archive). The façade had the coat of arms of Sixtus V: his mountains with the star can still be seen on the top of the tower. The bees of Urbanus VIII surround the elegant clock. On the lateral wall on the right there is a nice sun of Urbanus VIII. In 1632 Francesco Borromini was appointed architect of "La Sapienza" and for nearly 30 years he worked to complete the bulding with a library (Biblioteca Alessandrina) and a church (S. Ivo) which is definitely his masterpiece. The façade follows the pattern of the courtyard designed by Giacomo della Porta while the dome is very innovative, first of all because of the hexagonal shape of its high drum. The vertical lines of the drum pillars continue through the pyramid covering the church to reach the six pairs of columns of the lantern which is topped by a spiral. In the interior of the church the sides of the hexagon are of a different design: three are concave and three are convex, but the diversity ends at the top. The use of stucco decoration and in particular of angels' heads is typical of Borromini. Vasi shows the spiral of S. Ivo in the plate covering S. Eustachio. The inner courtyard and the church of S. Ivo show the coats of arms of the popes who one after the other contributed to building and decorating the current palace. (top left) The dragon of Gregorius XIII; (right) the lion, pears, mountains and star of Sixtus V; (lower left) the eagle and the dragon of Paulus V.
(left to right) Urbanus VIII is represented by his bees (in addition to the fact that the spiral of S. Ivo is said to represent the sting of a bee). The dove with the olive tree of Innocentius X is at the very top of the spiral. Alexander VII put his coat of arms on the façade of S. Ivo, but it's been removed; maybe he feared this would occur so he instructed his symbols be used as decoration elements (the six mountains are inside and outside S. Ivo and even the small piers are decorated with acorns and stars). Teatro Valle was inaugurated on January 7, 1727: Roman theatres were active only during the carnival period, but notwithstanding the short season in the XVIIIth century they were a very profitable investment. January 7 is the first day of carnival. In December 1816 Gioacchino Rossini was commissioned an opera for the forthcoming carnival and he composed in a rush La Cenerentola. The premiere at Teatro Valle on January 25, 1817 had the same unfavourable response which had occurred a year earlier to the first performance of Il Barbiere di Siviglia at Teatro Argentina, but eventually La Cenerentola became the hit of the season. It was the last opera buffa by Gioacchino Rossini. The façade was redesigned in 1821 by Giuseppe Valadier. Palazzo della Sapienza included Biblioteca Alessandrina named after pope Alexander VII, who took the decision to provide the university with a large library just a few days before his death in May 1667. 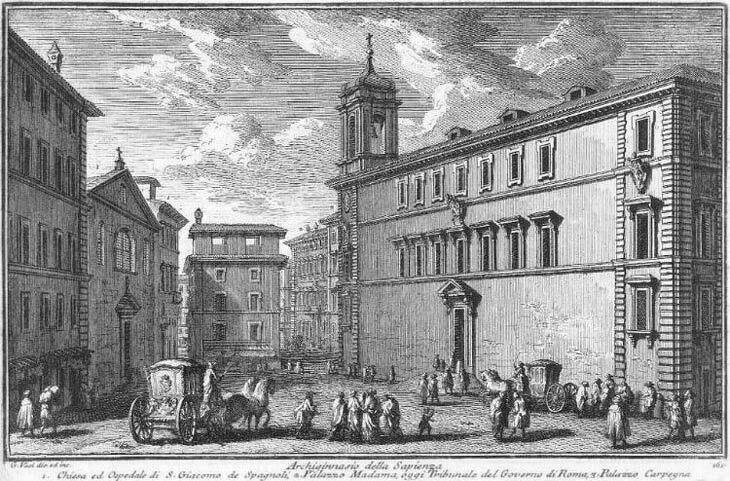 13,000 volumes which once constituted the library of the dukes of Urbino were moved here (today they are in the modern location of the University of Rome). ... Dipoi voltando nel vicolo, che le sta a sinistra, ed entrando nel primo vicolo, si trova a sinistra il Teatro della Valle, ed appresso l' Archiginnasio della Sapienza Era già perduto lo studio delle scienze, non meno di quello delle belle arti, per le continue guerre d'Italia, e sciagure di Roma, quando s. Gregorio il grande pensò di rimetterlo. Innocenzo IV. stabilì quello dell'una, e dell'altra legge, Bonifacio VIII. eresse quivi le pubbliche scuole l'anno 1293. e Clemente V. vi stabilì le cattedre delle lingue, e altri Pontefici vi hanno aggiunto quelle di altre scienze. Il primo architetto della fabbrica fu il Buonarroti, o secondo altri il Bramante; ma poi fu terminata sotto Alessandro VII. 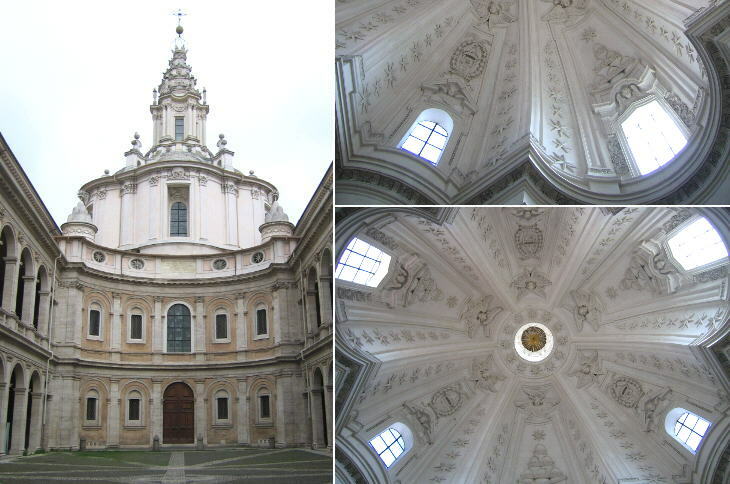 dal Borromini, il quale fece nel gran cortile la chiesa con la cupola di una nuova invenzione, tanto nell'interno, che nell'esterno ammirabile. Fu dedicata a s. Luca Evangelista, a san Leone Magno, e a s. Ivo avvocato de' poveri, avendovi fatto il quadro Pietro da Cortona, ma per causa di morte fu terminato poi da Gio. Ventura Borghesi suo allievo.